They went looking for lava tubes on Mars — and found what may be a hole in the roof of a Martian cave. The 16 students in Dennis Mitchell's 7th-grade science class at Evergreen Middle School in Cottonwood, Calif., chose to study lava tubes, a common volcanic feature on Earth and Mars. It was their class project for the Mars Student Imaging Program (MSIP), a component of ASU's Mars Education Program, which is run at the Mars Space Flight Facility. The imaging program involves upper elementary to college students in Mars research by having them develop a geological question to answer about Mars. Then the students actually command a Mars-orbiting camera to take an image to answer their question. Since MSIP began in 2004, more than 50,000 students have participated to varying extents. "The students developed a research project focused on finding the most common locations of lava tubes on Mars," Mitchell said. "Do they occur most often near the summit of a volcano, on its flanks, or the plains surrounding it?" To answer the question, the students examined more than 200 images of Mars taken with the Thermal Emission Imaging System (THEMIS), an instrument on NASA's Mars Odyssey orbiter. Philip Christensen, a Regents' Professor of geological sciences in the School of Earth and Space Exploration, is the instrument's designer and principal investigator. The students chose for their targeted THEMIS image (plus a secondary backup image) areas on Pavonis Mons volcano that had yet to be photographed by THEMIS at highest resolution (18 meters, or 59 feet, per pixel). On their two targeted images the students found lava tubes, as they had hoped. And on the backup image, they also found a small, round black spot. Many Martian lava tubes are marked by aligned chains of collapse pits, which typically have flat floors and sloping sides. The spot the students found, however, appears to have vertical sides. Such features made a stir in the news in 2007, when Glen Cushing, a U.S. Geological Survey scientist, published a paper showing several Martian examples, which had been located using the heat-sensing capability of THEMIS. He argued that these holes were anomalous as compared to the usual chain pit crater, being smaller and resembling a relatively straight-sided shaft going down into the ground. Cushing proposed that these anomalous pit craters are "skylights" – places where a small part of the roof of a cave or a lava tube had collapsed, opening the subsurface to the sky. They typically appear cooler than the ground surface by day, but warmer than it by night. This is exactly what would be expected, given that Martian surface temperatures have a large diurnal range, while subsurface temperatures hold fairly even. "This pit is certainly new to us," Cushing told the students. "And it is only the second one known to be associated with Pavonis Mons." He estimated it to be approximately 190-by-160 meters (620x520 feet) wide and 115 meters (380 feet) deep at least. In addition, he said, the spot appears clear against the background surface of Pavonis Mons. "It sticks out like a sore thumb in THEMIS predawn thermal observations." The students have submitted their site as a candidate for imaging by the High Resolution Imaging Science Experiment (HiRISE) camera on NASA's Mars Reconnaissance Orbiter. HiRISE can image the surface at about 30 centimeters (12 inches) per pixel, which may allow a look inside the hole in the ground. "The Mars Student Imaging Program is certainly one of the greatest educational programs ever developed," Mitchell said. "It gives the students a good understanding of the way research is conducted and how that research can be important for the scientific community. This has been a wonderful experience." 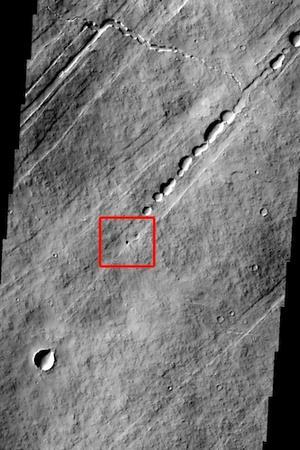 The small round black spot in this THEMIS image may be a hole in the roof of a Martian lava tube or cave.